Home Blog When To See A Doctor For Cold? Common cold or simply cold is a frequently experienced condition by almost everyone. It is one of those health conditions that can be managed at home efficiently with the help of adequate rest, natural home remedies and least medications. Cold is nothing but a mild form of viral infection of the upper respiratory, which is the nose and throat. Cold tends to affect different people differently and may also show a different intensity and a varied set of signs and symptoms in different patients. Similarly, each person’s reaction towards cold depends entirely on their constitution type and their level of immunity. Generally, recovering from cold does not take longer than a week. In certain patients, signs, and symptoms resolve in less than a week, while in others certain complaints tend to persist even the standard period of recovery. 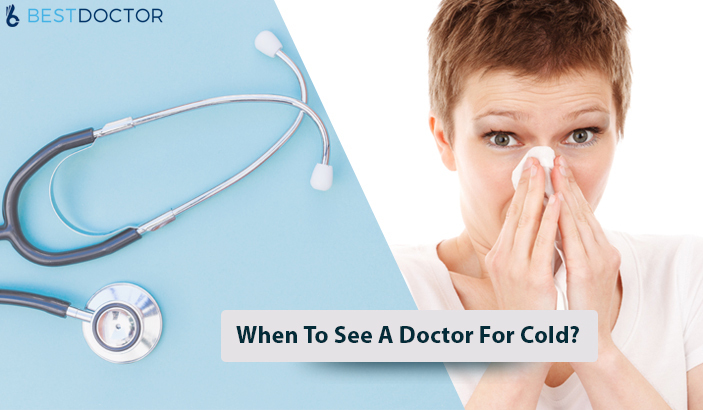 This article will help you understand all about cold and when to see a doctor for a cold. Cold can occur due to exposure to a large number of viruses. Irrespective of the causative virus, re-infection is possible due to exposure to the same virus or a different virus strain. Inhalation – Since cold is an illness of the respiratory tract, inhalation of viruses present in the atmosphere or inhalation of droplets when an infected patient coughs or sneezes can cause cold. Although it is possible to manage cold at home with the help of medications and natural home remedies. Yet, it is equally important to know that you need to visit the doctor for cold if you belong to any of the high-risk group of patients. This is because the intensity of illness tends to great in such patients; also, these patients are highly susceptible to experience complications of the common cold. Ear infections may occur if the upper respiratory tract infection spreads to the ear via the Eustachian tube (a tiny tube that connects the middle ear and the throat for draining of the middle ear). Managing cold is relatively simple as it subsides within a week without too many complications. Yet, it is essential to understand certain warning signs and symptoms which indicate greater severity of cold and its complications. Antibiotics may be prescribed if secondary bacterial infections like tonsillitis, sinusitis or ear infections are present. Doing so not only helps one to seek either through personal or online consultation with a certified doctor but also helps in preventing serious health conditions which may occur as a result of these complications.